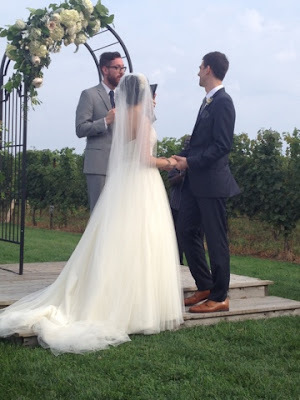 For the long weekend, I took a little road trip to Connecticut for the wedding of my high school friend, Nanna. But first I made a detour to New Haven to see another old friend, Donna. For the short trip in New Haven, Donna made sure that I tried New Haven Pizza, aka apizza. I've seen it featured on Travel Channel food specials and even tried it almost two decades ago (with not much memory of it). Apizza: a thin crusted pie topped with oregano, tomato sauce and Pecorino-Romano cheese (mozzarella is considered an additional topping). 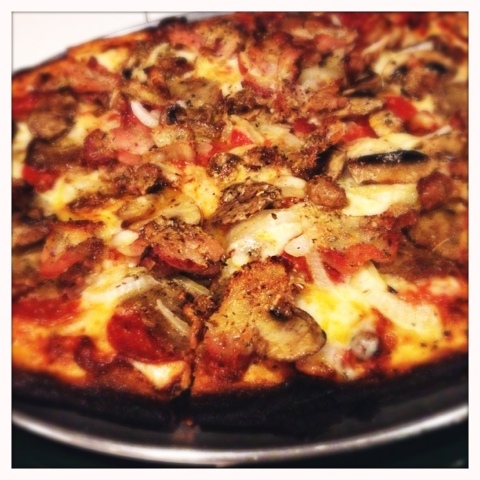 Originated at Frank Pepe Pizzeria, which also created the clam pizza. Donna took me, Twin Sista and Twin Sista's bf to the less crowded but just-as-tasty Abate Pizzeria. We proudly devoured a meat lover's and a clams casino pizza (bacon, clams and fresh bell peppers). I didn't think it was much different (or any different) from your average pizza but it was pretty delicious. Extra bonus: the garlicky clams from the clams casino. I'm sure my breath was lethal afterwards. 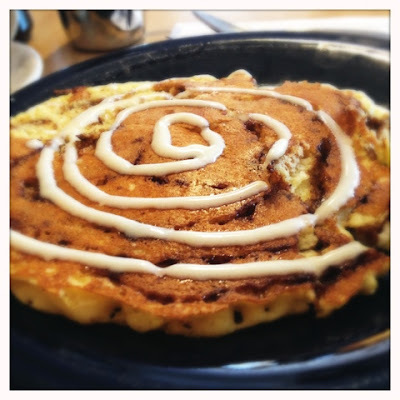 For brunch the next day, Donna and I went to The Pantry and couldn't help but order a cinnamon roll pancake. Whoa, amazingly good. Wasnt too sweet (I didn't add syrup) and so delicious. Usually I don't even like sweet stuff for breakfast but this totally hit the spot. Off I went to Nanna's wedding with a happy, full belly and was thrilled to witness such a beautiful ceremony and to celebrate with her on her special day. 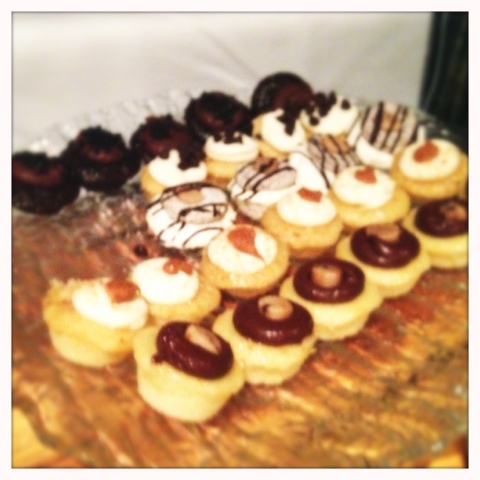 Her wedding even had a spread of mini cupcakes at the dessert table. Cute and super yummy. Then the weekend ended with a pitstop in Providence, Rhode Island to get some lunch before the friends caught their flights home. We stopped at a Korean restaurant that served a unique dessert: moffles. Moffles are mini waffles with a mochi rice cake tucked inside. 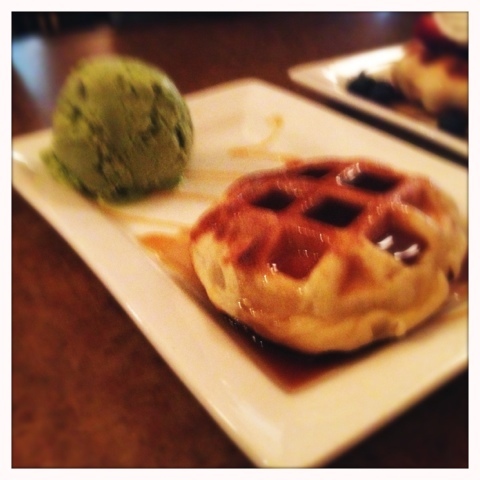 Tasted like a gooey, cold waffle but it was kind of delicious. I kind of wished it was served hot so then when eaten with ice cream you could get a combo of hot and cold. I guess I could get adventurous and try to make some of my own.